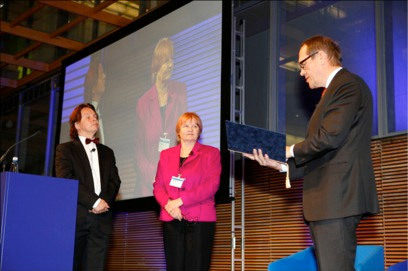 Chairman of the Nokia Foundation Board Henry Tirri, Award 2011 receiver Professor Riitta Hari, and Chairman of the Nokia Corporation Board of Directors Jorma Ollila. This year’s winner of the Nokia Foundation Award is Professor Riitta Hari due to her scientific contributions to the brain research field. Professor Hari has pioneered the use of MEG to record the spatiotemporal pattern of brain activity, thereby providing fundamental insights into auditory, somatosensory, visual, and pain processing as well as motor control in healthy subjects and patient groups. Professor Hari also has demonstrated the existence of a “mirror-neuron system” in the human brain, as well as abnormalities in this system in autistic subjects as examples of Hari’s contributions. Riitta Hari’s exemplary career and devotion to scientific research has made her a positive role model for many young scientists. Previous recipients of the Nokia Foundation annual award include Lauri Kuokkanen (1995), Pekka Tarjanne (1996), Linus Torvalds (1997), Arto Salomaa (1998), Kullervo Nieminen (1999), Osmo A. Wiio (2000), Ilkka Haikala (2001), Veikko Rintamaki (2002), George Metakides (2003), Heikki Lyytinen (2004), Moncef Gabbouj (2005), Marten Mickos (2006), Pekka Abrahamsson (2007), Aapo Kyrola and Sampo Karjalainen (2008), Jimmy Wales (2009) and Jaakko Astola (2010).